“It’s that time of year when the world falls in love. . .” croons Frank Sinatra in “The Christmas Waltz.” It’s among the first songs my family blasts on the way home from Thanksgiving dinner at Nana’s house. And while I sing along in the car, while it’s still November out, I mean every single Christmas-adoring word. Then it happens. Right around mid-December, when the pace of the season is at a full-out sprint, my professed love for all-things-Christmas begins to sound less convincing. Festive gatherings I once looked forward to with childlike enthusiasm become more obligatory, more like boxes that need checking off. And I think, Here I am again, another high-stress Christmas season—same song, second verse, a little bit louder, a little bit worse. Because “he himself is our peace” (Ephesians 2:14), the Son given to us, Jesus, has made peace possible with God and with those around us. Yet we often find ourselves caught up in the season’s buzz, feeling everything but peaceful, wishing there was a way to lighten the load at Christmas. 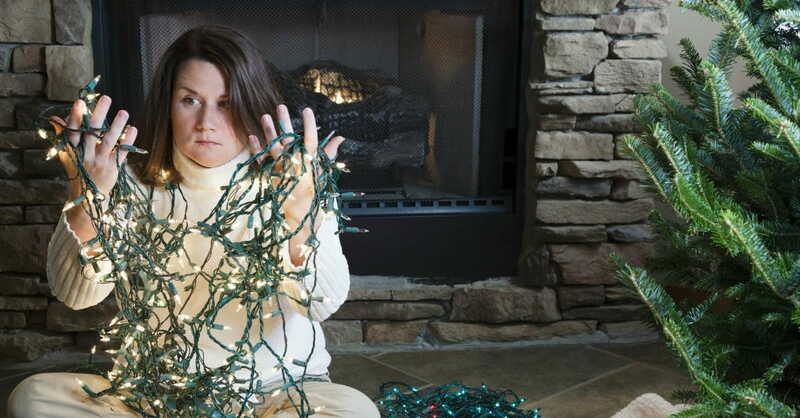 Here are 10 Ways to Lessen Stress at Christmas. 1. Connect with Jesus Daily. When I was a kid, my mom had a knack for knowing who I hung out with on any given day. Some influences were good and some were not so good. "You are who you're with," she'd say. Even though the bad friends are long gone, a few negative influences still linger, especially during the holidays: my desire for control, my need to people-please, and my reluctance to choose “what is better” (Luke 10:42) by sitting at the feet of Jesus. Pastor Jon Courson puts it this way: "You're missing out on what only I can produce as you spend time with me (Jesus). Even if you have the principles down and the theology right, without me there will be no self-control and peace, love and joy, gentleness and goodness. Those only come from spending time with me." So whether you’re buying or wrapping presents, baking or decorating cookies, driving to a Christmas play or hosting a gala event, you can connect with Jesus anytime, anywhere. And when you do, your priorities will realign and stress will diminish. 2. Don't be One of Those Christians. Maybe you know one—someone who gets annoyed when Christmas cards wish people “Happy Holidays” instead of “Merry Christmas.” Someone who thinks Santa is just “Satan” with a few misplaced letters. Someone who gets frustrated at folks who only come to church on Christmas Eve. Someone who limits gifts to three-per-kid because, well, isn’t that how the Wise Men did it? Let’s not be so stressed and concerned over our reputation and good deeds that we miss the whole point of Christmas: Jesus, the one God sent to reconcile us “to himself and [give] us the ministry of reconciliation” (2 Corinthians 5:18). 3. Avoid Thinking This Christmas Has to be the Best One Yet. This year’s Christmas party dress shopping reached a new high for me—more like a new low—as my quest for the “best dress yet” got a little out of hand. I do this to myself, not just with clothes, but in my attempts to buy the most wow-factor presents, find the cutest-shaped Christmas trees, and create the most memorable trip to the mountains. It’s nonsense, really, because I did the same thing last year and the year before, treating every Christmas like it’s the last one on earth. If you’re like me, instead of giving every nook and cranny of Christmas your undying devotion, why not embrace things high on your list of importance and hold loosely to things of little importance? This could mean skipping the yearly Christmas card mail-out so time is freed-up to tackle that 1,500-piece puzzle with your teens. Or it could mean swapping out that yearly purchase of matching family Christmas pajamas for an overnighter in the mountains. Simply make one or two things—not 99 things—“the best one yet” this Christmas, and see if your stress remains a thing of Christmases past. 4. Make Loving Others a Priority. If I were to create a list, “10 Things that Make Christmas Feel Christmassy,” I wish I could say “Loving Others Well” would be at the top. But I’m pretty sure I’d add Christmas lights, cold weather, Hallmark movies, and FedEx deliveries before any mention of love. I would probably add “religious” stuff too—such as filling shoeboxes, leading an Advent study, and reading Luke 2 on Christmas Eve—without ever really loving a single soul. The good news is, genuinely loving others isn’t something we’re left on our own to do. The whole reason we’re able to love in the first place is “because He first loved us” (1 John 4:19). So let’s run to the source of love, Jesus Himself, asking Him to increase our love for those He places in our paths. 5. Allow Others to Love You. Just like loving others brings much-needed peace and meaning to the frenzied Christmas season, being a recipient of someone’s love does the same. But too often our pride gets in the way. We like being self-sufficient and self-sustaining; we don’t like people finding out about our messiness. This holds especially true in light of what we post online: perfectly-staged everything. Then we act as though we have a social media rep to protect! But because we are “God’s chosen people, holy and dearly loved” (Colossians 3:12), let’s clothe ourselves with humility. Let’s allow people to reach out to us, to help us, to love us. 6. Bring to the Season Who You Already are and What You Already Have. Ever feel like you’re doing the whole “Christmas thing” wrong? You have one string of lights thrown over a bush while the neighbor has over 50 strings set to music. You use plastic forks when you host a party. You don’t own an ugly Christmas sweater. Your Christmas cards aren’t printed on quality cardstock. You mumble through the song, “Gloria in Excelsis Deo,” because you don’t know how to pronounce it. Relax! Nowhere in Scripture does it give exact instructions on how to celebrate Christmas. As stated above, feel free to bring to the season who you already are and what you already have (fancy forks, optional). 7. Participate in Advent Candle Lighting. 8. Take Care of Your Body. Sure, Christmas is the most wonderful time of the year, but when it brings us face-to-face with strained family dynamics, financial problems, or loved ones no longer with us, the season can wear us down mentally, emotionally, and, more than ever, physically. Dessert sits atop every kitchen counter, the season’s weather brings us inside where it’s warm, and constant celebrations—involving family, work, and school—throw off our routines, disrupting how we eat, sleep, and workout. Because it’s impossible to keep the same schedule in December as we do in less-crazed months, we must set realistic goals. Only pick one or two things to be a stickler on. For me, because sugar sends me into a total mental fog, I try avoiding it on days no parties are planned. I also make sure, by hook or by crook, to move my body five days per week. If I’m able to squeeze in a solid fifty-minute workout, great! If it looks more like 10 five-minute workouts spread across a single day, I’ll take it! 9. Focus on the Privilege of Gift-Giving. “When it comes to giving, let’s make our focus not on the ‘have to’ of giving the gift, but the ‘get to,’” suggests author Becky Kiser. What a blessing it is to have people in our lives we love dearly, people we want to lavish. Not just loved ones, but those in need; they’re a blessing too—people who produce hearts of compassion within us. And when gift-giving is done intentionally and on-budget, stress lessens. In 2 Corinthians 9, Paul talks about Christian giving, where he wraps up the end of the chapter by pointing to the greatest giver of all, God Himself: “Thanks be to God for His indescribable gift.” What Jesus did on the cross is the single most generous act of all time! Let’s be of the same mind as our Savior and be a giver of good gifts (James 1:17). 10. Don't Get Easily Offended. There they were, offended by our Santa. And there we were, offended by them taking offense. It’s quite comical when you think about it. The point is, we could all extend a little more grace to one another and not sweat the small stuff this Christmas season.